This is home of The Bees In The Dale and novice beekeeping tales along the Backwards and truly Organic Way. The bees are feral bees collected from wild swarms. Bees do it all alone, no help from me, no drugs, no meds, no treatments by humans, just shelter and water. Having hidden bees in the city is not enough. We have to get out and promote bee culture and inform the public when we can. This was a "green" expo put on by the City of Torrance. Laura brought her bees and helped man the booth. Randy who ended up organizing our effort talking to Roberta. Everyone came from the old Backwards Beekeepers but now belong to HoneyLove.org and.or Long Beach Beekeepers. We cross pollinate between the groups to spread the bees news in Los Angeles. What started out as a slow day got busy very quickly. We had bees, pictures and samples of wax to show and offered free "local" honey tastings. As I explained to most people who wanted to know where the honey came from, I could not testify it was from Torrance since the city does not allow bees. But it was very, very local honey. Laura brought several package of small Popsicle sticks to use for tasting, about 200, and we ran out if them . Laura brought a hive so the public could see how they are used. Most people have no idea. having only seen stacks of "bee boxes" in orchards. We had visitors from all over, including a Torrance Sister City in Japan. Right next door was the chicken people. they are trying to get city approval just like we are. Bees and chickens had boards for comments which will get to the Cit council. We even had a local bee stop by to sample the honey. Just keep those taster samples coming and you will get a crowd. Next time we will be a little better organized and have some honey sticks to sell. 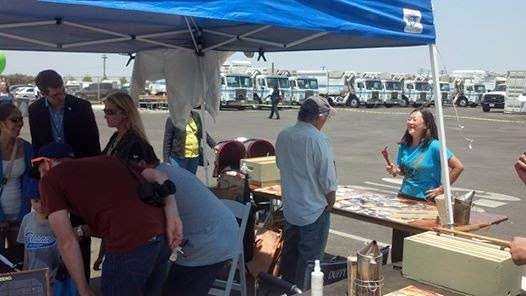 It was a good day, well attended and maybe we scored some more votes for bees in Torrance. New York City has just approved beekeeping. The City of Santa Monica made some changes in their bee laws and Redondo Beach, CA has changed their laws to allow beekeeping. The Los Angeles City Council is investigating the legalization of bees in that city. It will take a while but change is coming. To quote Kirkobeeo: "We are changing the world, one beekeeper, one hive, at a time." I am new to bees and do not have a background in the field. I will be happy to try and answer any questions but you might be better off contacting HoneyLove,Org . Our original organization, Backwards Beekeepers has disolved and most members have joined HoneyLove which share our aims and methods. It is 501 (c) 3 and any donations are tax deductible. A LARGER AND WIDER SHOT OF MOST PICTURES CAN BE SEEN BY CLICKING ON THAT PICTURE. The only book about totally natural beekeeping is Complete Idiot's Guide to Beekeeping. If you want to learn how to have bees without the use of chemicals, this is the book to have.